Summer is a wonderful season for salad lovers with all the fresh fruits and vegetables coming to market. I tend to fall into a rut with my salads, making the same old salad over and over again. Do you do the same? In the past week, I've noticed beautiful watermelon displays in the produce section of my grocery store. 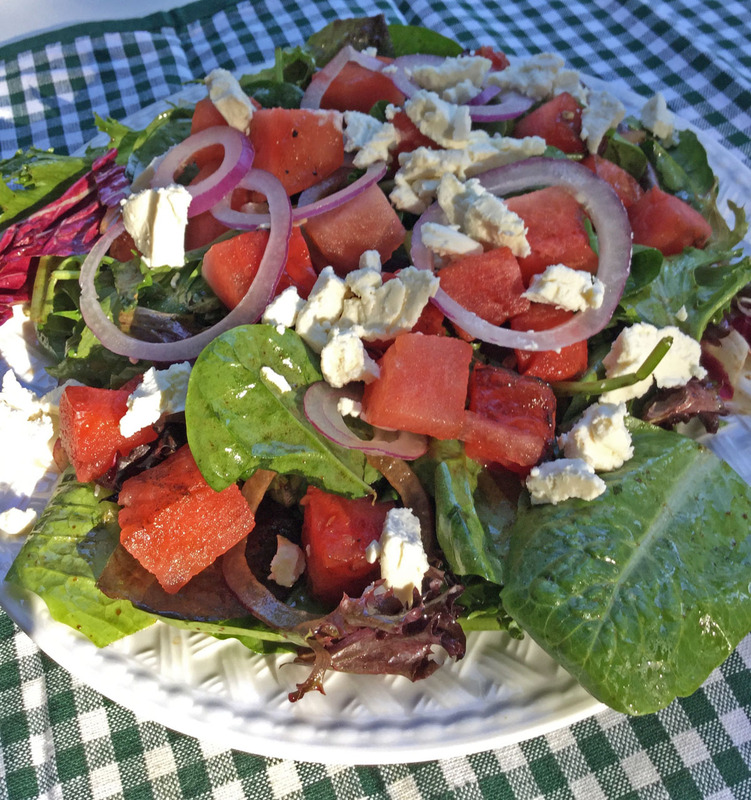 With watermelon hitting its peak over the next few weeks I thought I would branch out and try a salad made with watermelon as the star ingredient. I've seen lots of watermelon salads over the years in magazines, on television cooking shows and on Pinterest. Today's recipe is inspired by all those other watermelon salad recipes but was made with tasty ingredients I had on hand. I encourage you to do the same. Your pantry and refrigerator may not contain the same ingredients I had on hand to make this salad. Feel free to be adventurous with other ingredients you love. Instead of goat cheese, you might try feta cheese or Gorgonzola cheese. You don't have any fresh mint? Try a little fresh basil or fresh thyme instead. Preheat your grill. Cut the watermelon into triangles. 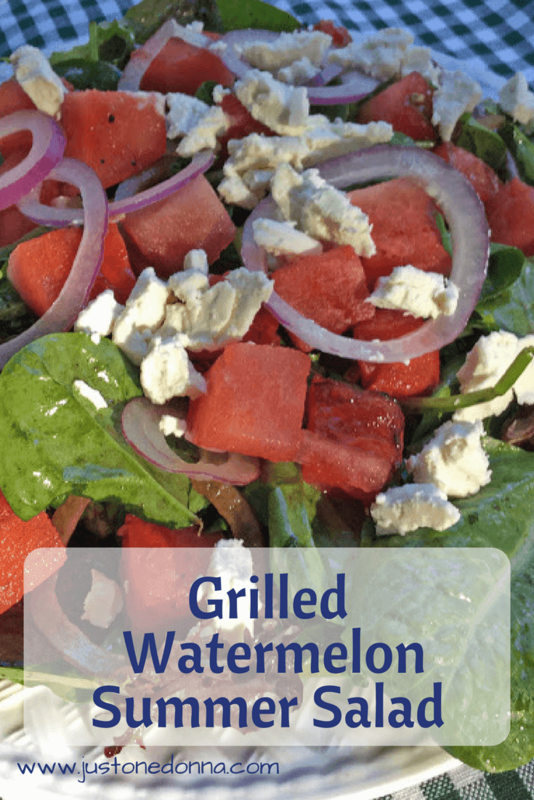 Place the watermelon triangles on the grill, cooking for a minute or two on each side. 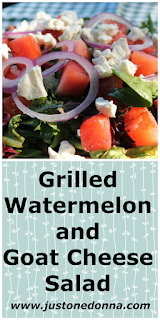 You want the watermelon to be warmed and have grill marks. Remove to a plate. Divide the baby lettuce among four plates. 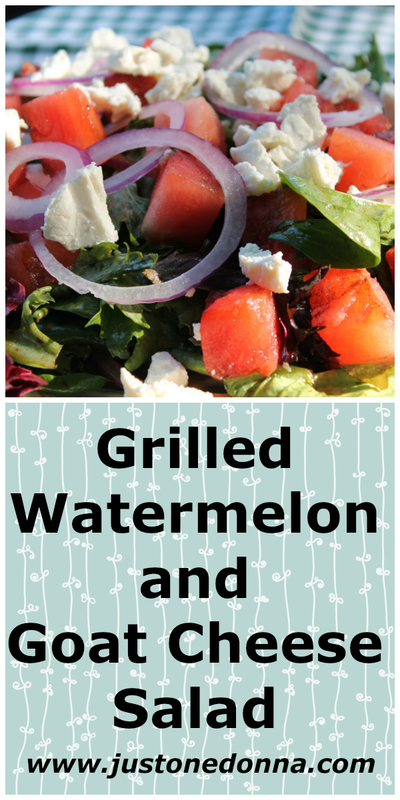 Cut the watermelon into chunks and divide among the plates. Top with the salad with sliced onion and pieces of goat cheese. Sprinkle with the chopped mint. Mix together the balsamic vinegar and olive oil. Season with salt and pepper to taste. Spoon the dressing over the salad and serve immediately. This is a lovely, fresh-tasting salad that is sure to get you out of your salad rut. 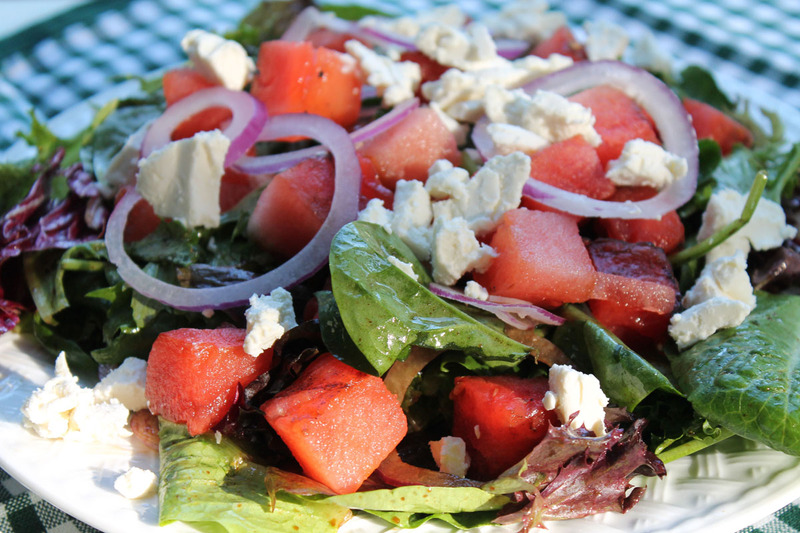 The contrast of the sweet watermelon with the tart goat cheese and balsamic dressing will delight you taste buds. This Blueberry Salad will also perk up your summer salad menu.